Real Ale Champion : Ron Buchet, the organiser of every Cambridge CAMRA Octoberfest and deputy organiser for many Cambridge Beer Festivals. As well as these branch awards we also presented awards to some of our local breweries and cider makers. These awards come from CAMRA’s Champion Beer of Britain competition and our own competitions held at beer festivals. 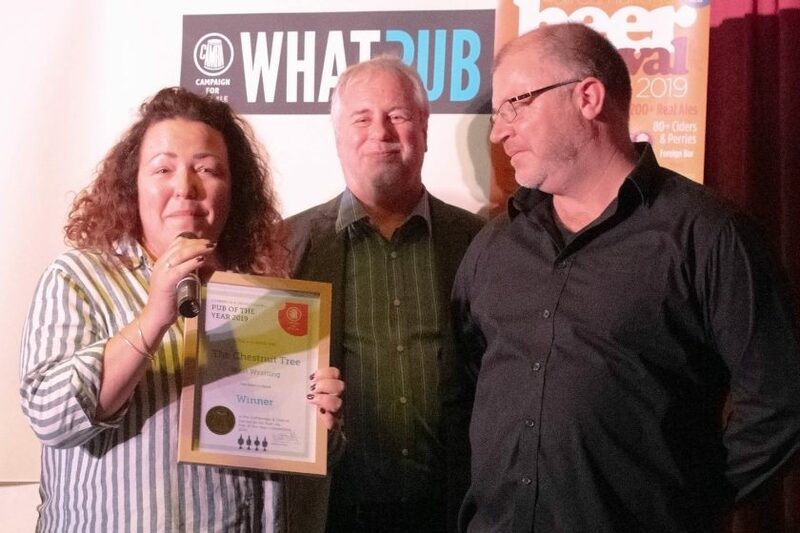 Calverley’s Brewery won Gold for their Porter in the porter category at both the East Anglian and overall national competitions, and went on to win Silver in the national Champion Winter Beer of Britain award. Milton Brewery won Silver in the East Anglian stout competition for Nero, and Bronze in the best bitter category for Pegasus. In our festival competitions, Crafty Beers won Beer of the Festival for Sauvignon Blonde at last year’s 45th Cambridge Beer Festival. At the same festival Simon’s Cider won Cider of the Festival for COX!!! and Perry of the Festival for Gibson’s Perry. Many congratulations to all our award winners, and many thanks to the NCI Sports & Social Club for hosting us. See you next year.